Editor’s note: Google Analytics is a treasure trove of information – sometimes too much data. 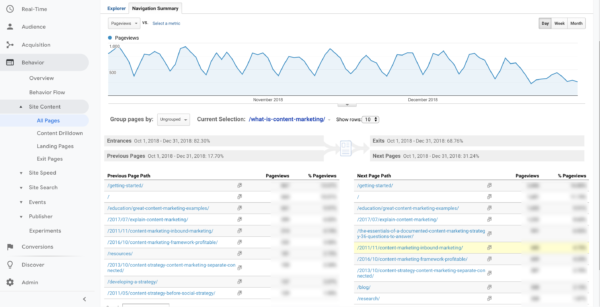 That’s why we brought back this article about four Analytics reports that every content marketer should review. 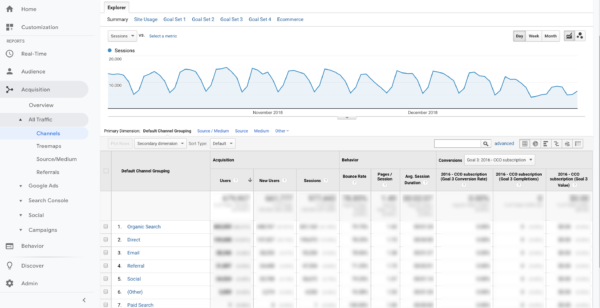 While you can use the data from Google Analytics in myriad ways, the four most helpful reports for your content marketing cover traffic, navigation summary, traffic from organic search, and conversions. 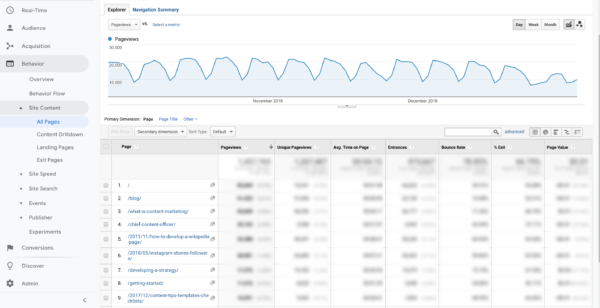 The traffic report (referred to as Pages report in Google Analytics) looks at the pages getting the most traffic on your website. By default, it also displays metrics such as time on site and bounce rate. To expand the list of pages, change the number of rows displayed by going to Show Rows at the bottom left of the screen. Also, make sure the report encompasses an appropriate period. I typically look at search volume from the past quarter, six months, or year for this exercise. Ensure that the page puts your brand’s best foot forward. Is this page on message? Does it have current information and the best calls to action? Include your best links. Given that high-traffic pages bring a lot of visitors, make sure to include links to relevant, high-converting pages and posts. Though there are several ways to dig into pages to see how visitors are behaving, my favorite report is the Navigation Summary, where you can see 1) how visitors get to a page and 2) where they click once they are there. In the traffic report, click on any page. At the top, click the option for Navigation Summary. This page shows how visitors are navigating to this page from within your website – and you can see where visitors are clicking. As with the traffic report, you can adjust the number of rows displayed. Google Analytics used to offer an In-Page Analytics report, which showed where visitors are clicking any page on your website, but that report didn’t show how visitors were getting to the page. You can add that feature to your browser with the Google Page Analytics extension for Chrome. The Previous Page Path is useful so you know which page someone visited on your website right before they arrived on the page you’re analyzing. It offers some context to understand how people get to this page, and it may offer clues as to what information people have – and what they still need. 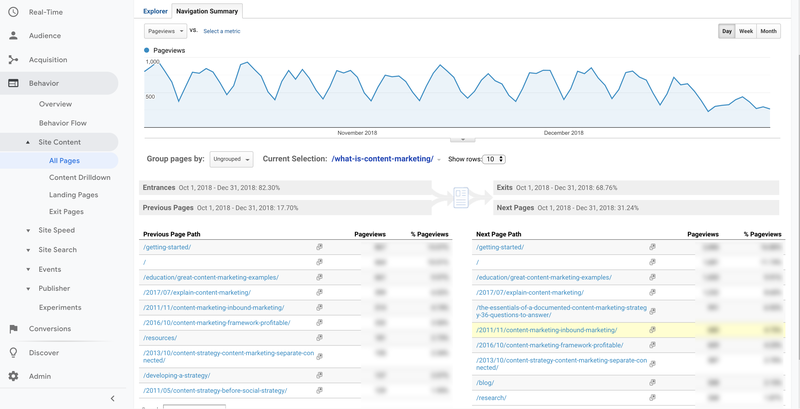 The Next Page Path shows what people clicked on that page to continue on your site. This data may indicate what questions people still have. Additionally, you can see whether people are clicking to pages that convert well (more on that later). Not only do you want to know which pages are getting traffic in general, but it’s also useful to understand which pages are popular in organic search. If a page is getting a lot of traffic from search, be more sensitive when you make changes to that page. For instance, you would not want to rewrite the text because that could significantly affect how Google ranks that page. It offers the opportunity to learn more – with some additional work – about the traffic on these pages. Go to Acquisition > All Traffic > Channels. You see a list of the channels driving traffic to your web pages. Select Organic Search and then Landing Page (under Primary Dimension). To find traffic on a specific page, such as a blog post, paste everything after your primary URL into the search box. 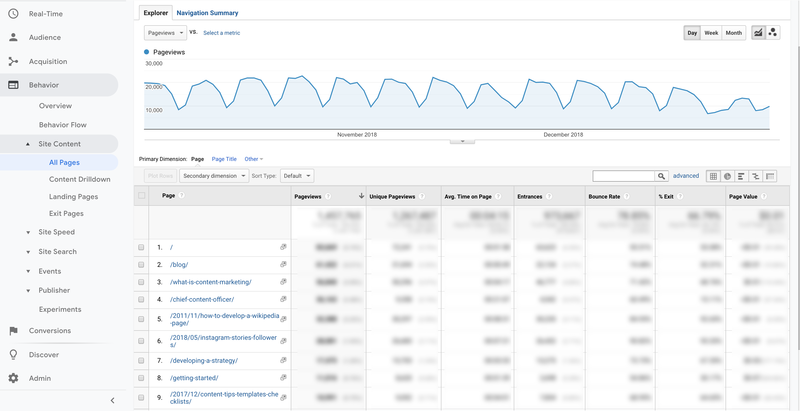 You can see the effect of organic search traffic on that page by looking at the absolute number of sessions as well as a percentage of your search traffic. Consider two things about pages that get a lot of search traffic. First, use caution when making changes. Understand that these pages likely rank well in Google. Be careful how much you change on this page, as you don’t want to negatively impact how it comes up in search. I’m not suggesting that you never change the page but tread more carefully and monitor more frequently how the pages perform after you make changes. The good news is that there are ways to learn more about why people are visiting these pages. I use SEMrush for this purpose. Here’s an example of how to do this using one of our search-magnet pages – Developing a Strategy. Go to SEMrush and paste in the URL of the page. Scroll down on the page to the section for top organic keywords. 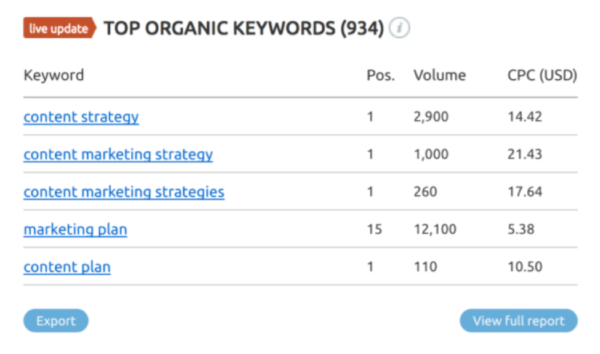 See how well your keyword results for the page match your intentions for the page. If you see that your intent for the page is different than the way visitors are using it (and their needs are relevant to your business), keep this page as is. Then create a new page that better helps with the initial topic you had in mind. In most content marketing programs, conversions are a critical metric – they are actions you want visitors to take when they arrive on your website. Do you want them to sign up for an email? Download something? Attend an event? Once your goals are set, track them under Conversion > Goals > Overview. You can look at the goals in aggregate or by pages converting to specific goals. The higher the conversion percentage, the more likely a visitor to that page converts. These are the pages (which Andy calls conversion champions) that you should share and promote. Optimize these pages so they have a higher likelihood to show up in search. Link to these pages from your high-traffic pages. 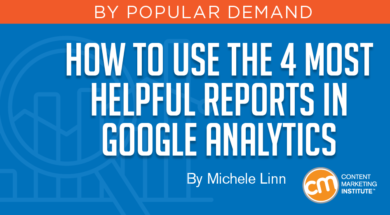 These are just four ways to use Google Analytics so you can take action. Want more? Read How to Apply Analytics Data to Make Better Content Marketing Decisions. Want more information to make your content marketing measurement easier? Subscribe to our free weekday newsletter.